This week’s post is really about the coloured stuff & why too little of it is dangerous. Note, I say coloured stuff because it aint just yellow – check out this herald article if you don’t believe me (or just admire this beautiful photo). 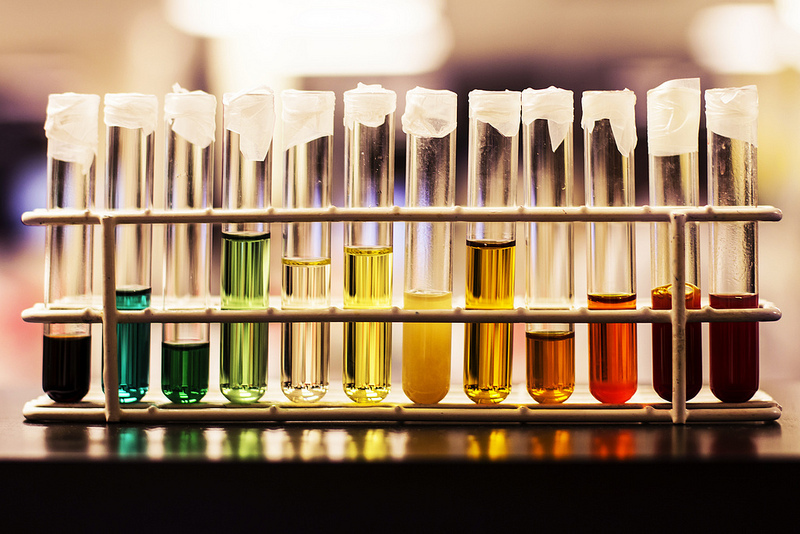 A rainbow of urine from a hospital lab. Credit: laboratory scientist Heather West. A long time ago, when Greeks wore togas, and not because they couldn’t afford shirts, a chap named Galen* noted that if you didn’t pee you’re in big trouble. It took 1800 more years before the nephrologists and critical care physicians got together to try and decide just how much pee was too little. This was at some exotic location in 2003 where these medics sat around for a few days talking and drinking (I’m guessing at the latter, but I have good reason to believe…) until they came up with the first consensus definition for Kidney Attack (then called Acute Renal Failure, now called Acute Kidney Injury)1. It was a brilliant start and has revolutionised our understanding of just how prevalent Kidney Attack is. It was, though, a consensus rather than strictly evidence based (that is not to say people didn’t have some evidence for their opinions, but the evidence was not based on systematic scientific discovery). Since then various research has built up the evidence for or against the definitions they came up with (including some of mine which pointed out a mathematical error2 and the failings of a recommendation of what to do when you don’t have information about the patient before they enter hospital3). One way they came up with to define Kidney Attack was to define it as too little pee. 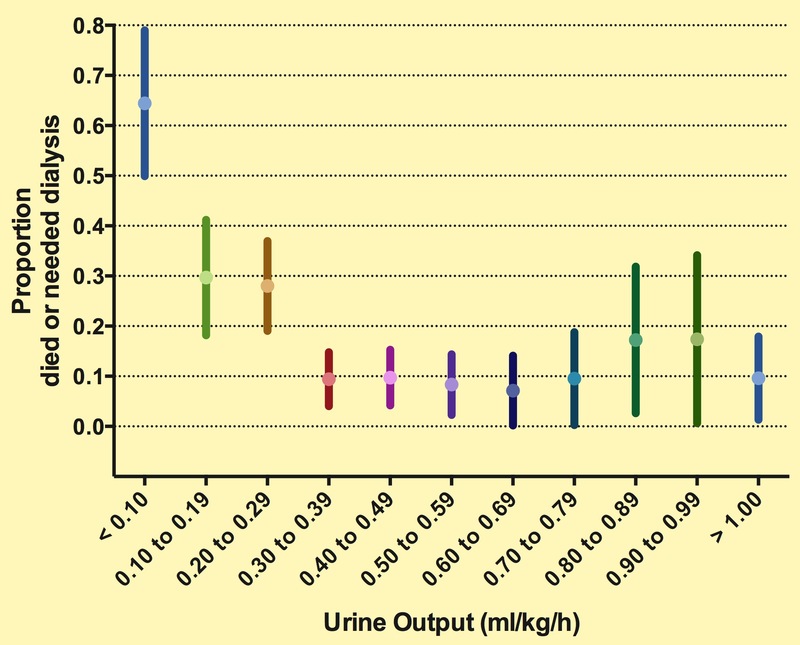 Too little pee was defined as a urine flow rate of less than half a millilitre per kiliogram of body weight per hour over six hours (< 0.5ml/kg/h over 6h). Our groups latest contribution to the literature shows that this is too liberal a definition. The story of our research is that as part of a PhD program Dr Azrina Md Ralib (an anaesthesist from Malaysia) conduct an audit of pee of all patients entering Christchurch’s ICU for a year. She did an absolutely fantastic job because this meant collecting information on how much every patient peed for every hour during the first 48 hours as well as lots of demographic data etc etc etc. Probably 60-80,000 data points in all! She then began to analyse the data. We decided to compare the urine output data against meaningful clinical outcomes – namely death or need for emergency dialysis. We discovered that if patients had a flow rate of between 0.3 to 0.5 ml/kg/h for six hours it made no difference to the rates of death or dialysis compared to those with a flow rate greater than 0.5. Less than 0.3, though, was associated with greater mortality (see figure). For the clinician this means they can relax a little if the urine output is at 0.4 ml/kg/h. Importantly, they may not give as much fluid to patients. Given that in recent times a phenomenon called “fluid overload” has been associated with poor outcomes, this is good news. The full paper can be read for free here. Proportion of mortality or dialysis in each group. Error bars represent 95% confidence intervals.From Ralib et al Crit Care 2013. 1. Bellomo R, Ronco C, Kellum JA, Mehta RL, Palevsky PM, Acute Dialysis Quality Initiative workgroup. Acute renal failure – definition, outcome measures, animal models, fluid therapy and information technology needs: the Second International Consensus Conference of the Acute Dialysis Quality Initiative (ADQI) Group. Crit Care 2004;8(4):R204–12. 2. Pickering JW, Endre ZH. GFR shot by RIFLE: errors in staging acute kidney injury. Lancet 2009;373(9672):1318–9. 3. Pickering JW, Endre ZH. Back-calculating baseline creatinine with MDRD misclassifies acute kidney injury in the intensive care unit. Clin J Am Soc Nephro 2010;5(7):1165–73. So all those 0.3 and greater……urine luck! So what was her dissertation called? “Taking the Piss”?